This redevelopment site consists of approximately 1 acre on a prime hard corner ½ block from Galleria entrance (Nordstrom). It is non-restricted as to uses (no zoning) –potential for hotel, retail, office, residential redevelopment is strong in this market. The site currently contains a small retail center with short term leases. According to a recent title search, there is no height restriction, nor density restrictions placed on the land (development is subject to City of Houston ordnance). The site is adjacent to Lakes on Post Oak – 1 Million+ sq.ft. office, residential, and in immediate proximity to the Galleria which hosts ~24 Million annual visitors shopping in its over 2.5 million sq. ft. of retail. Sage Road is home to the area’s newest hotels. 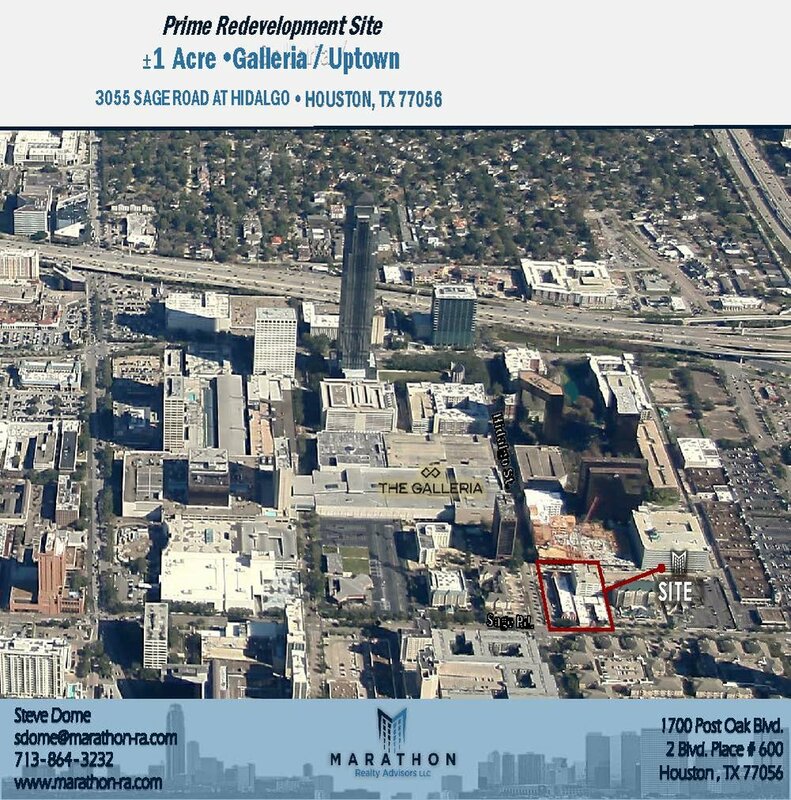 This prime, ~1 acre, hard corner, site presents one of the best redevelopment opportunities available in the city of Houston. Situated in the Galleria/Uptown area, it is positioned within immediate proximity to the Galleria Mall. The property is surrounded by quality offices, the city’s most notable retail, national and international hotel chains, and high-end residential. Viewed as a true urban district within the city, Uptown has a history as a thriving mixed-use area and continues to attract quality occupants as well as visitors. The site is located at the southeast corner of Sage Road and Hidalgo in the Uptown submarket.